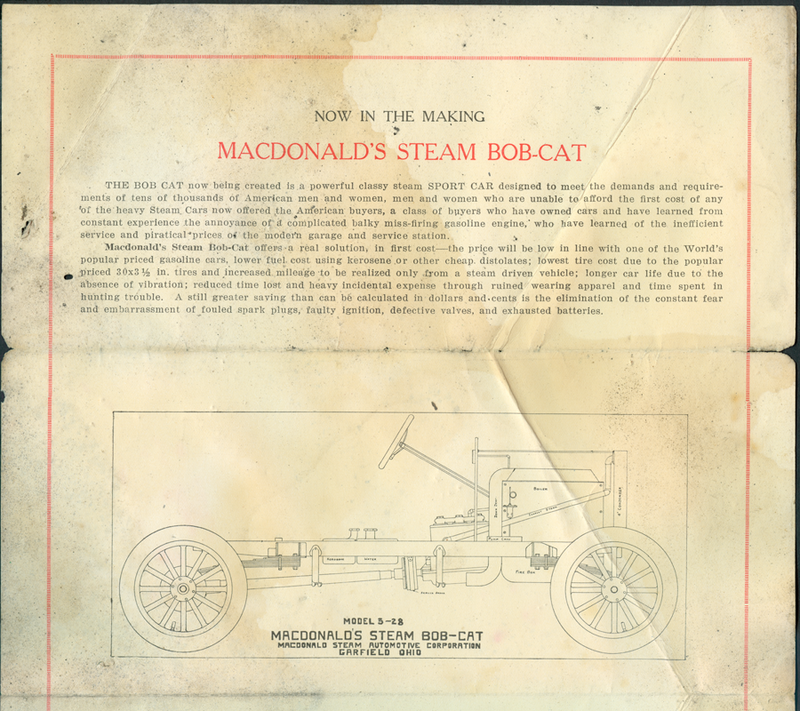 This Company attempted unsuccessfully to market a steam roadster called the MacDonald Bobcat but the car failed to catch on. Closed models were also offered, but most MacDonald engines were ultimately used for those who wished to convert their gasoline cars to steam. The MacDonald Steam Automotive Corporation was active in 1923 and 1924. It may have been a successor or somehow related to the Gearless Motor Company. Future research will resolve these issues. 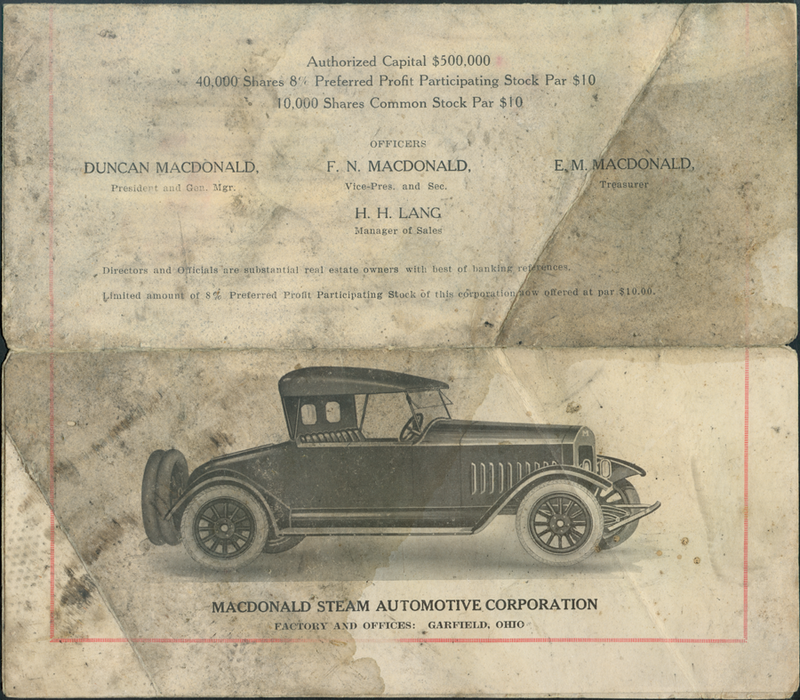 Duncan MacDonald was the President and General manager of the MacDonald Steam Automotive Corporation. As early as 1930, Duncon MacDonald was working with Jeffrey Carqueville to produce a steam car. Duncan MacDonald was in Los Angeles, CA by then and as late as 1935 was still working on steam cars. 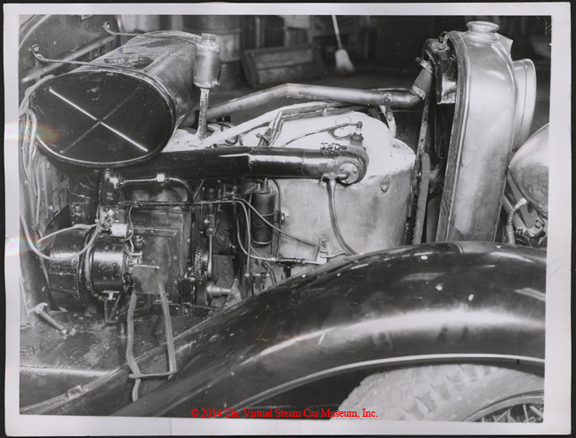 His car was featured in a press photo dated January 1936. More research on Duncan MacDonald will clarify these relationships. 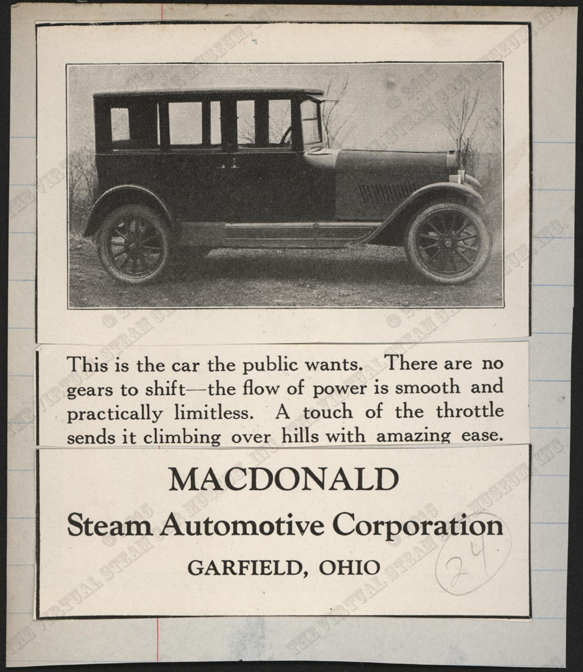 This brochure indicates that Mr. McDonald was once president of the Gearless Motor Company, another late manufacturer of steam cars. 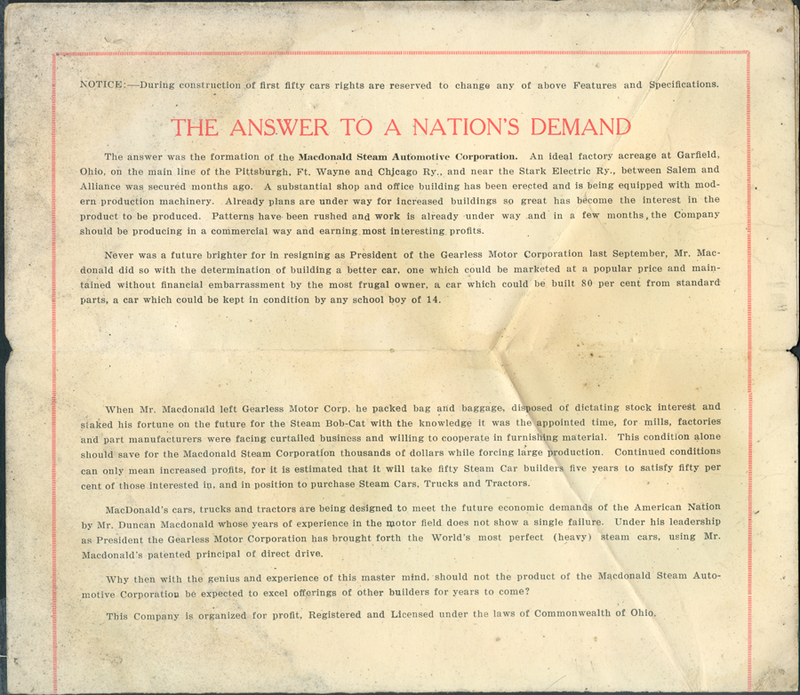 This brochure has been reproduced. Donor: Kelly Williams. Visit Kelly's Stanley Register on Line. 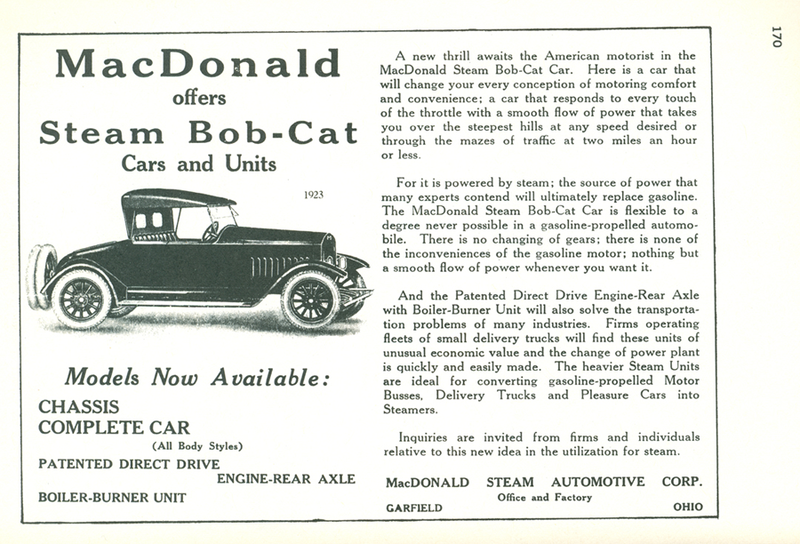 The McDonald Steam Automotive Corporation advertized in the January 1924 issue of Motor Magazine for District Distributors. Page 282. FIX DATES! The McDonald Steam Automotive Corporation advertized in the January 1924 issue of Motor Magazine for District Distributors. This advertisement is found in Floyd Clymer's Steam Car Scrapbook, p. 170. As with almost all of the illustrations and material in his Scrapbook, (a very appropriate description) Clymer lists no sources.2 There is another photocopy in the Conde Collection. This material is dated 1924, and it was clipped and assembled from the MacDonald January 1924 advertisement in Motor Magazine, page 368. John A. Conde Collection. 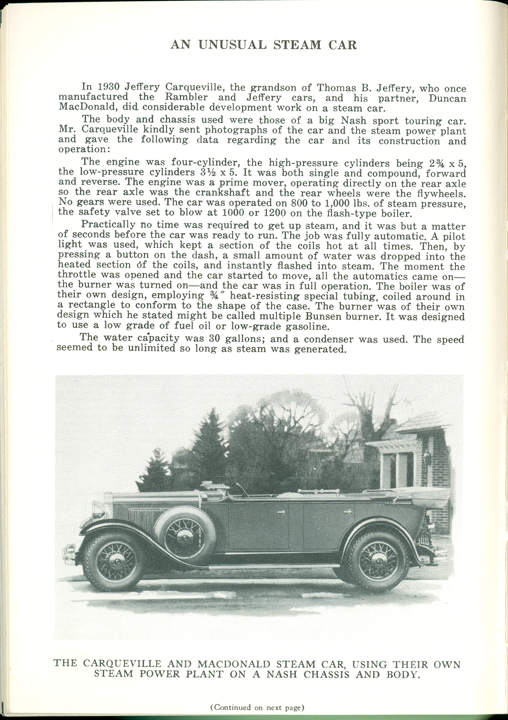 Floyd Clymer reproduced these pages in his Steam Car Scrapbook, pp. 180 - 181. 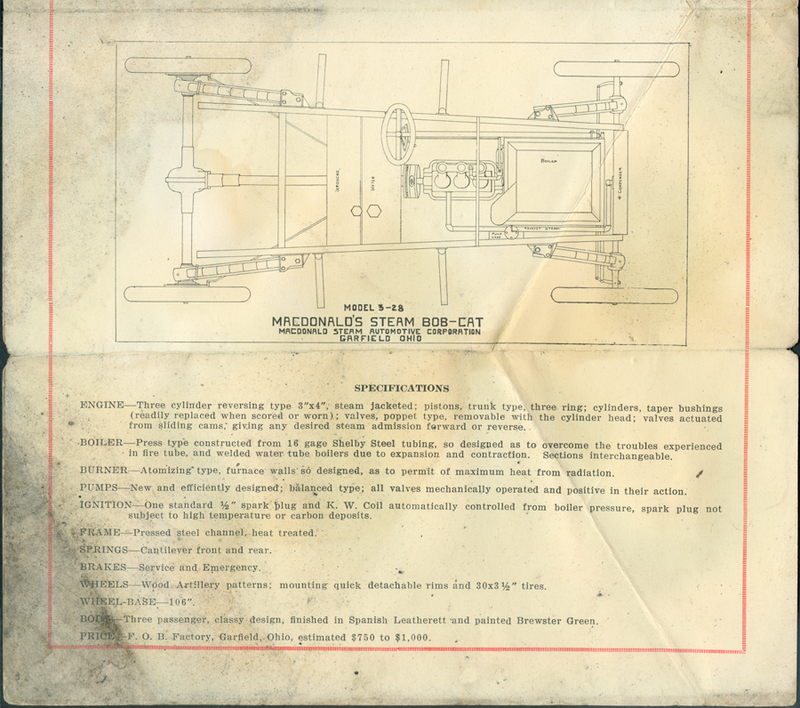 It references Duncan MacDonald as working in 1930 on an advanced steam car. 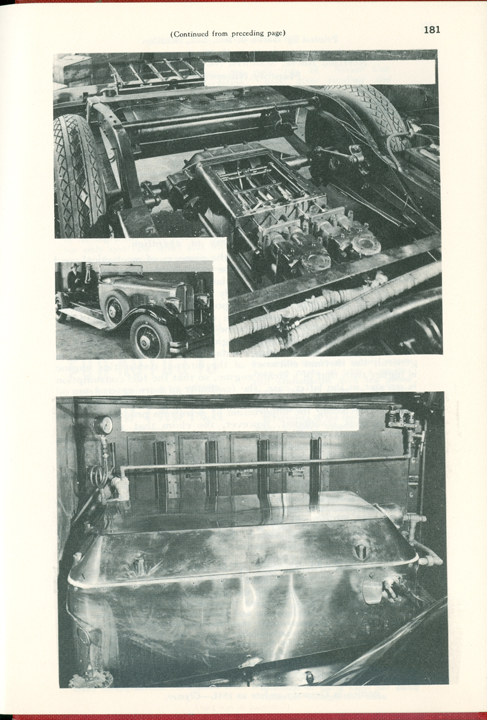 This photograph illustrates Duncan MacDonald's steam generator. THe photo is dated January 27, 1936. Duncan is identified as a Los Angeles, CA Engineer. 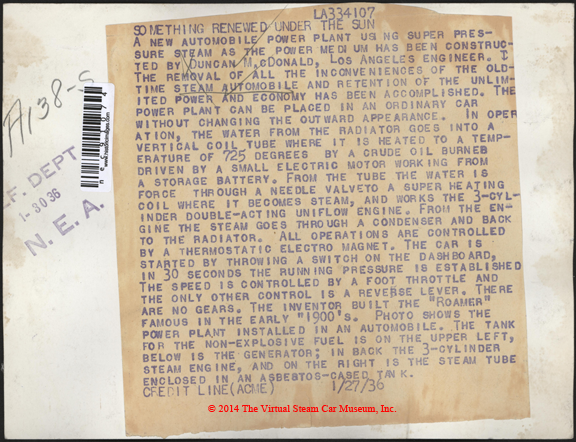 John A. Conde's McDonald Steam Automotive Corporation file folder. John A. Conde Collection. 2Floyd Clymer's Steam Car Scrapbook, (1945, Bonanza Books, Crown Publishers, Inc.), p. 170.